Fonroche Lighting is a family-owned business that has been pioneering solar power solutions for more than ten years. Now considered the world's leading provider of off-grid solar lighting solutions for public facilities, we offer a comprehensive range of solar streetlights under our Smartlight brand. Energy efficient, low overall costs and environmentally sustainable: solar powered lights are the way to go! Our Smartlight range comprises French-made products, combining high performance and longevity for all types of applications. Delivering more energy-efficient public lighting systems as part of infrastructure development projects is one of the major environmental challenges of our time. Fonroche's innovative solar lighting technology offers a viable alternative to grid-tied lighting systems for city and local authorities, businesses, industry and retailers. Fonroche Lighting has deployed its advanced technological expertise for hundreds of projects in France and worldwide, and hundreds more projects are currently underway or under development in every corner of the globe. In Senegal, we recently won the contract for the world's largest-ever public solar lighting project, involving the installation of 50,000 solar streetlights to meet one-third of the country’s lighting requirements. "Durability and reliability are the hallmarks of our products, making them the perfect choice for any public lighting project!" Founded in 2008 by Yann Maus, the Fonroche Group is a major player in the renewable energy industry, specializing in three main areas: off-grid solar lighting, biogas and deep geothermal energy. Fonroche manages all aspects of projects for business and local authorities in each of its core markets, from manufacture to installation, operation, maintenance and support. Fonroche designs, builds and operates waste-to-energy biogas plants. In France, three Fonroche designed biogas plants are currently in operation, three more are under construction and an additional 15 projects are in the pipeline. Fonroche is a major provider of high-temperature geothermal energy solutions. We have been awarded eight exploration permits in France, and the first drilling has begun in Vendenheim, Alsace. 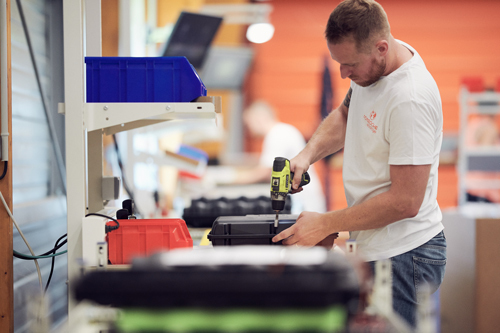 The teams at our production plant in Roquefort, near Agen (southwest France), span the entire value chain, from design and solar and photometric surveys, to manufacturing, installation and maintenance. These state-of-the-art facilities provide a swift response to customer requirements and deliver the guarantee of "Made in France" for all Fonroche Lighting solutions.